WASHINGTON – General Electric, the world's largest industrial company, has quietly become the biggest beneficiary of one of the government's key rescue programs for banks. As a result, GE has joined major banks collectively saving billions of dollars by raising money for their operations at lower interest rates. Public records show that GE Capital, the company's massive financing arm, has issued nearly a quarter of the $340 billion in debt backed by the program, which is known as the Temporary Liquidity Guarantee Program, or TLGP. The government's actions have been "powerful and helpful" to the company, GE chief executive Jeffrey Immelt acknowledged in December. GE's finance arm is not classified as a bank. Rather, it worked its way into the rescue program by owning two relatively small Utah banking institutions, illustrating how the loopholes in the U.S. regulatory system are manifest in the government's historic intervention in the financial crisis. "We'd like to regulate companies according to what they do, rather than what they call themselves or how they charter themselves," said Andrew Williams, a Treasury spokesman. GE's ability to live in the best of both worlds – capitalizing on the federal safety net while avoiding more rigorous regulation – existed well before last year's crisis, because of its unusual corporate structure. Unlike other major lenders participating in the debt guarantee program, including Bank of America, Citigroup and J.P. Morgan Chase, GE has never been subject to the Fed's stress tests or its rules for limiting risk. Also unlike firms that have received bailout money in the Troubled Assets Relief Program, or TARP, GE is not subject to restrictions such as limits on executive compensation. "The TGLP program has been a money maker for us," FDIC chairman Sheila Bair has said. "So I think there have been some benefits to the government and the FDIC." For its part, GE said that it properly applied for and qualified for the program. "We were accepted on the merits of our application," company spokesman Russell Wilkerson said. The current good fortune of General Electric, ranked by Forbes as the world's largest company, has roots in the Great Depression, when it created a consumer finance arm so that cash-starved families could buy its appliances. What grew from those beginnings is now a powerful engine of profit, accounting for nearly half of its parent's net earnings in the past five years. GE may be better known for light bulbs and home appliances, but GE Capital is one of the world's largest and most diverse financial operations, lending money for commercial real estate, aircraft leasing and credit cards for stores such as Wal-Mart. If GE Capital were classified as a banking company, it would be the nation's seventh largest. At the height of last fall's financial crisis, GE's cash cow became a potential liability. As credit markets froze, analysts feared that GE Capital was vulnerable to losing access to cheap funding – largely commercial paper, or short-term corporate IOUs sold to large investors. Company officials projected confidence. "While GE Capital is not immune from the current environment," Immelt said in October, "we continued to outperform our financial-services peers." Behind the scenes, they urgently sought a helping hand for GE Capital. One key hope was a rescue plan taking shape at the FDIC. They found a legal basis for the program in a 1991 law: If a faltering bank posed "systemic risk," then the FDIC, the Fed, the Treasury secretary and the president could agree to give the FDIC more authority to rescue a failing institution. The financial regulators applied the statute broadly, so it would cover the more than 8,000 banks in the FDIC system. "This was crisis management on steroids," said a person familiar with the process. "A lot was made up on the fly." The author of the systemic-risk provision, Richard Carnell, now a law professor at Fordham University, says it was intended to apply to a single institution, and that in their rush to find legal footing for unprecedented new programs, regulators "turned the statute on its head." The FDIC launched the program Tuesday, Oct. 14, the same day Treasury officials announced large capital infusions into nine of the country's banking giants under TARP. That day, the FDIC also expanded its deposit guarantees to a broader range of accounts. Within days, the FDIC held conference calls with bankers to explain the program. Agency officials explained that not all companies that owned banks were eligible. "The idea is not to extend this guarantee to commercial firms," David Barr, an FDIC spokesman, said during one of the calls. GE was watching closely. Though GE Capital owned an FDIC-insured savings and loan and an industrial loan company, they accounted for only 3 percent of GE's assets. Company officials concluded that GE couldn't meet the program's eligibility requirements. So the company requested that the program "be broadened," GE's Wilkerson said. GE's main argument was fairness: The FDIC was trying to encourage lending, and GE Capital was one of the country's largest business lenders. "GE was among the parties that discussed this with the FDIC," along with the Treasury and Fed, according to FDIC spokesman Andrew Gray. He said the details about eligibility "had not been specifically addressed" in the beginning. Citigroup, the troubled banking giant, also was pressing for an expansion of the FDIC program. Though Citigroup was included in the debt guarantee program, its main finance arm, Citigroup Funding, appeared ineligible. Fed Vice Chairman Donald Kohn wrote to the FDIC's Bair on Oct. 21, arguing that debt issued by Citigroup Funding should be covered "as if it were issued directly by Citigroup, Inc."
Two days later, the FDIC announced a new category of eligible applicants – "affiliates" of an FDIC-insured institution. Bair explained that "there may be circumstances where the program should be extended" to keep credit markets flowing. That meant "certain otherwise ineligible holding companies or affiliates that issue debt" could apply, she said. GE Capital now was eligible. GE Capital won approval to enter the FDIC program in mid-November with support from its regulator, the Office of Thrift Supervision. The company used the government guarantee to raise about $35 billion by the end of 2008. By the end of the first quarter of 2009, the total reached $74 billion, helping to cover the company's 2009 funding needs and about $8 billion of its projected needs for 2010. The debt guarantee program has "been of critical importance" to the fiscal health of GE Capital, said Scott Sprinzen, who evaluates GE's finance arm for the Standard & Poor's credit-rating company. He said the FDIC program enabled GE to "avoid an exorbitant price" for its debt late last year. 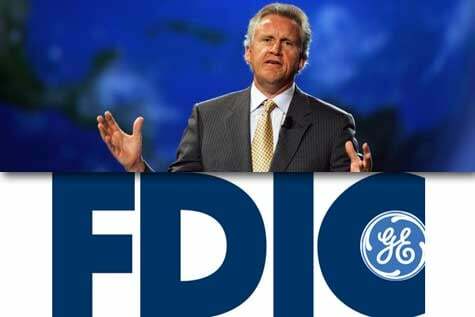 Like other companies in the program, GE pays the FDIC fees to use the guarantees – a little more than $1 billion so far. But as Bair explained to bankers last fall, the fees, while "healthy," are "far below certainly what the cost of credit protection is now in the market." Last week, Immelt said GE had no intention of doing that. "GE is and will remain committed to GE Capital, and we like our strategy," he said in a memo to staff. In its proposal to overhaul financial regulation, the Treasury Department pointed out that some firms operating under the existing rules, including collapsed companies such as American International Group, "generally were able to evade effective consolidated supervision and the long-standing policy of separating banking from commerce." GE's Wilkerson said the company generally supports regulatory reform but thinks that it should be permitted to retain its structure. "Bank reform has historically included grandfathering provisions upon which investors have relied, and there is no reason this settled principle should not be followed here," he said. He said the company "didn't have any choice" but to have OTS as its regulator. The company also objects to the Treasury's proposal to force firms to separate banking and commerce because that issue "had nothing to do with the financial crisis," Wilkerson said. Wilkerson said GE has remained profitable and avoided some of the exotic financial products that contributed to losses at other institutions. He also said that GE performed an internal stress test this year and found that its capital position was "quite strong by comparison to the banks." The FDIC has been working to wean financial institutions off the program. The TLGP originally was slated to end in June, but at the Treasury's request the FDIC agreed to extend it until Oct. 31. Some participants have stopped using the program, but GE Capital continues to do so for the overwhelming majority of its debt. Much of the $340 billion in debt will come due in 2012, the year the FDIC guarantees expire. At that point, known in banking circles as the "cliff," the agency would have to make good if companies such as GE are unable to honor their obligations. FDIC officials say they are comfortable that the agency has collected more than enough money to cover potential losses.